Workerscompzone is at Disneyland for the California Coalition on Workers’ Compensation 12th annual conference. One problem with these types of conferences is that there are so many interesting sessions that it’s hard to find time to sit down and do the blog. In coming days I’ll recap my impressions. But I don’t want to miss the opportunity to put in a word for a great organization, Kid’s Chance California. The organization has been around for some time in other states, but California’s group was organized last year. 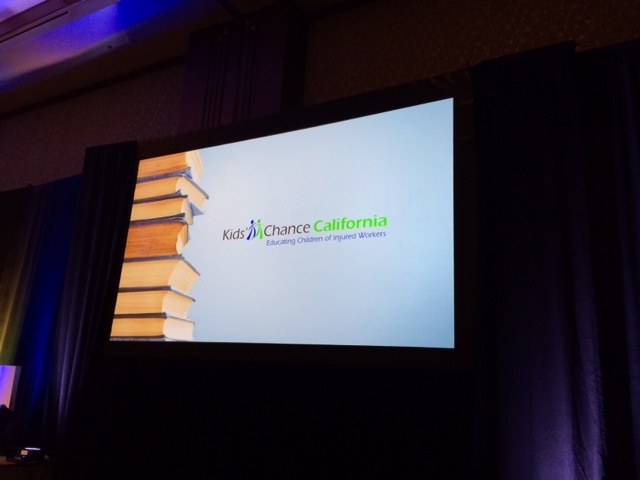 Kid’s Chance raises money from stakeholders in California’s workers’ comp industry and uses the money to give college scholarship grants to children of injured workers. Currently Kid’s Chance is sponsoring a group of students who had a parent who was either killed at work or suffered a disabling job injury. My firm, Boxer & Gerson, is proud to be one of the strong supporters of this organization along with Pacific Gas & Electric, Sedgwick CMS Claims, Paradigm, Titan Claims management and a number of other prominent California insurers, employers, adjusting firms, law firms, unions etc. At a donor thank you event at the CCWC conference, Kids Chance board member Maria Henderson (from PG&E) introduced two current scholarship recipients. Those kids made remarks about how important the funding has been in allowing them financing to stay in school. Major kudos are due current Kid’s Chance board members Maria Henderson, Dennis Popalardo (a partner at my firm, Boxer & Gerson LLP), James Wesolowski of Laughlin, Falbo, Levy & Moresi, Jay Ayala, Kevin Confetti of Sedgwick, Lisa Simone, Bary Baranowski, Hunter Stern of IBEW Local 1245, Christopher Thomas of Workforce Health and Lynda Stettler of Titan Claims Management. Ms. Henderson announced that in two years the group has raised over $200,000 for scholarships. It is off to a very impressive start. Children of disabled or deceased California injured workers are eligible to apply for the next round of college scholarships. If readers of the blog know an injured worker whose kids are struggling to get funding for college, please encourage them to apply.